I just played the first hour of this after picking up physical copies of DGS1&2 Best Price on an Amazon Japan sale a few months back. I’m really happy that I waited for the Case 1&2 improvements as this is perfect. It reads like a professional translation and I really just can’t wait to play more. I'm happy to hear that they are working on the 2nd one as well, great news. So, do I need a Japanese 3DS and copy of the game to make this work then? You need a modded 3DS and physical copies of the games. Region for the system doesn’t matter. Alternatively, you can wait for the final version of the Android patch releasing soon and buy the Japanese version off the google play store with the instructions on the Scarlet Study site. The Android version also works on PC via Bluestacks. Man... If that's what it takes, I guess I'll have to eventually. Want to hear what people think of this localization, since the AAI2 one was quite good. Time to hack my 3DS again! Yeah, no hard mod required. Aaaand I bought DGS. My Japanese is still far from being usable to read games and such. Hmmm I may be tempted to do this and then buy a copy of the game. AAI2 was great. It’s a shame capcom have a tendency Not to localise them. Is it relatively straight forward to do ? Depending on your firmware, it may or may not be straight forward to do. In terms of ease, the Android version on android or PC (via Bluestacks) is your best bet. Finally. I'm so glad it's finished and the fact they're working on the sequel is great news. Whelp, time to finally buy the first game. What are the differences between the Android version and the 3DS version? And is the Android version landscape? I've got my phone all ready and waiting for the android patch to hit. It's going to be so good to finally play this! Does the game run well on Bluestacks? This fandom is insane and I love it. Can't wait to try the second one. Watched the english translation of the first on youtube and it was pretty good. How easy is it to mod a new 3ds xl with up to date firmware? I'd totally do it for this. Awesome news! Does this work with the digital version of the game? I don't want to pay too much with shipping and stuff. Wow, this is great news. I'll have to look into this soon when I have some time. how hard it is to mod a 3DS? So I don't need the separate games, can I buy the 1+2 version? Or that has two cartridges? He's one of the most awkward and charming characters I've ever seen. Did Nintendo ever give a reason as to why they never brought this over. Oh gosh, I need this, the AA game I crave. It's not Nintendo's responsibility to localise Capcom's games. Whatever. Capcom then. It's still weird. I’m hoping that AA7 and more PS4 / Xbox / Switch / PC ports help rejuvenate the series and Capcom release AAI2 and the two Great Ace Attorney games. The first one is like a prologue to the second game. I have a lot of qualms with the new systems, but I have to say the overall story is the best in the series. It’s a damn shame between I2 and both of these we have to rely on the fans to bring them over. This isn’t the best ace attorney game but I’m still glad that people get a chance to play it. AAI2 is my favourite ace attorney game though and the translation patch for it was really good too. Really impressive that they managed to translate the entire game, that’s really not an easy process. On one hand, at least we're getting them. 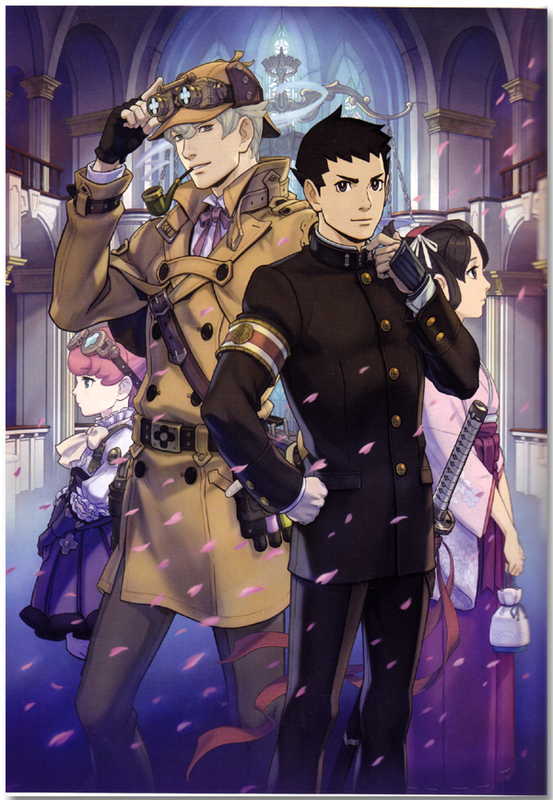 And at least AAI2 had fantastic fan translation, so hopefully that's also the case with DGS. But on the other hand, it's really stupid that it's come to this. Capcom continues to dilute the notoriety of the Ace Attorney franchise in the West, and it only makes things harder moving forward. There was a post on here I read yesterday which said that some Sherlock Holmes stories are not public domain in the US, and certain elements of this game borrow from them. Probably too much work to try and make a game as Japanese as this appear like it's set in America like they do with the main games. Are these the same guys that translated AAI2? Had no idea there was a nearly complete fan translation for this! Excited to play it soon. How hard is it to hack a 2ds? -The two GAA games sold pretty terribly in Japan, and the series was already on a discouraging decline at that point, not even getting physical releases overseas for the two most recent titles. The recent Ace Attorney Trilogy remake is going to play a big part in whether the series continues or gets shelved for a while. -While the character 'Sherlock Holmes' is not an issue for copyrights, some of his later stories are. Some of which are referenced in these games. But more than that, the Conan Estate does love to challenge even safe use of the characters. Even if it's an easy win for Capcom to beat the Estate in court, that still costs a not small amount to do. But ultimately the simplest answer is probably the best: Capcom doesn't think it's worth it. We love the idea of some dramatic, Hollywood reason why a company doesn't do something we like such as "it's the Conan Estate's fault!" with a 'villain' but you have to remember that AAI2 wasn't localized either and there isn't a single thing offensive or copyright related in that game that could hurt it or Capcom. Capcom simply didn't think it was worth it financially to put together the localization team again to bring it over. Ugh. I'm really exhausted of the "Eat your hamburgers, Apollo" meme. Took a funny a joke and ran it directly into the ground until it was a bloody smear. The factual relationship between Japan and England at the time is a massive part of the story. Awesome! I expect great things from an Ace Attorney localization, so I'm excited to see how this stacks up. If they were to localize this, it's very doubtful that they'd need to consider setting the game in America. The reasons for no localization are definitely elsewhere. Talking about Miles investigation 2, is there a fan translated patch too? Different team, but there’s someone from the AAI2 localization working on it. It’s two cartridges, and you’re good. It’s just a repackaged version of the two games.